Would you love to make a coat or jacket, but the task seems too daunting? Well, we've got the perfect book for you! For this installment of the Book Nook, we're taking a peek at Built By Wendy Coats & Jackets by Wendy Mullin. Wendy Mullin is the designer behind the Built By Wendy clothing line, and has a loyal following of artists, musicians, comedians, actors, stylists (and a lot of us normal folk too) for customers. 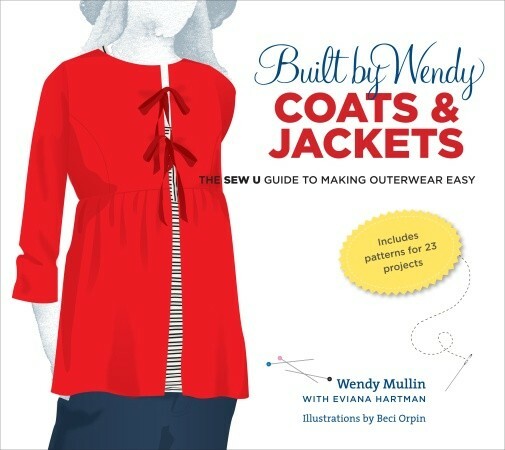 She has lots of experience designing and making coats and jackets, so you'll definitely be getting a ton of expert advice and helpful tips in this book! Right off the bat, Wendy gives us a little "pep talk" and lets us know what to expect from the book - we're feeling more confident already! The first chapter goes over the three patterns that are included in the book (a bonus! ), how to take your body shape into consideration when choosing a coat/jacket, design details - cuffs, pockets, closures, how to choose the right fabrics for your project, and trims. The next chapter is all about the utilizing the included patterns to the fullest - how to keep them in great shape so they can be used over and over again, altering them to fit you, and making additional pattern pieces for other elements. This chapter also has sections on cutting and folding fabric, pattern placement, and a section on tools. Chapter 3 tackles the sewing - seams, hemming, facings, attaching details - all those little things that make a difference. Now we're ready to tackle those projects! Chapter 4 offers six variations based on the fitted jacket pattern, Chapter 5 has eight projects based on the basic jacket pattern, and Chapter 6 shows you how to make nine coats based on the straight coat pattern. Just think of the jacket/coat wardrobe you could have! We're giving this book a "two thumbs up" because it's loaded with great info, has patterns included, and it's spiral bound so it lays flat when open - something we think that every craft book should do! We'd like to give you a chance to try this book out, so we're excited that Potter Craft is generously donating a copy for us to give away! Leave a comment here telling us why you'd like to win it. Make sure the comment also includes your first name, last name, city and state so we can find you. Be sure to like us on Facebook as well, and fill out our contest registration form - the link is located on our Facebook page. Deadline for comments is Tuesday, July 31st, 2012 at 5 pm Eastern time. Last but not least, we'd like to announce the winner for our previous Book Nook. It's Anna Singleton from Williamstown, MA ! Congratulations Anna! I have one of her other books, so I'd love to add this to my collection! THis looks like a great book. I'm sure it would be a big help. Jackets are the hardest thing for me to alter to fit, so I haven't made one in a long time. I would love to have her professional advice! I have my new sewing machine, my Bertha cabinet is to arrive today and I should have it assembled by the time this book would arrive. It would be a great way to break everything in and get back to the seams. I have done a lot of sewing in the past, but feel a little rusty right now, so I would love to get back into making things for my granddaughter. This would be a great help. Thanks for the chance to win. I've been wanting to make jackets and coats for myself because I'm tall and rarely do I find a jacket in my budget that actually is the proper sleeve length for my long arms. I've been too afraid to try because it does look so difficult. I have an incomplete jacket that has been hanging in my closet for a long time. I'm not quite sure how to finish the edges or closures. I'd love to win this book to finish that AND start a NEW jacket. I started sewing some of my clothes, but don't have confidence to do lining. I think this book might help me with this - sounds wonderful. Thank you Potter Craft and Arrow for this. YES! YES! I've been unemployed since February and now getting back to my sewing (when not on computer searching for new job). This book would be a God send to help me..
this sounds like a great book that I could use in my quest to get back to garment sewing. I am always so cautious when I see a pattern that would be a nice addition to my wardrobe. It's the fit that worries me. Hopefully, this book will add the confidence I need. This is just the book I need! Would love to win it! Just the refresher I need. Now all I need is time. I LOVE books, and am looking for ways to improve my sewing skills in making my own apparel! I "SEW" want to get into SEWING some clothes and would love to win this book!!!! I am ready to sew for "me" and this book looks like it has an updated look for me. I would like to own it! GREAT resource in my sewing library!!!! Would love to add this to my books. I don't really have any sewing books to begin with and I would like to sew some clothes! Also my 15 year old is into sewing and making her own fashion! Thanks! Love books about coats and jackets. I've been brushing up on sewing and this looks like just what I need!! With fall just around the corner I would love a new jacket that I could ware with pride. LOVE this, and just in time for coat/jacket season :) Thanks for the chance to win! Looks like an awesome book....I would love to win! Would love to have this in my little collection.. I would love to win this because reading it might give me the courage to tackle making a jacket. I tend to have to make my own jackets because my my broad shoulders and long arms, so I would love this book. However, because of privacy concerns, I cannot put public my location. I would do so privately, if you can contact me. I am intimidated when it comes to making my own clothes, although I would love to! This book seems to be filled with a tremendous amount of information that would be very helpful!! I forgot to mention that I am in Kansas City, Kansas! Thanks for the chance to win a great book!! I would love to win because I'm not clear on how to and this book looks great. I'd LOVE to win Wendy Mullin's book. A wonderful opportunity to learn new sewing skills. And, just in time for fall.